INTERVIEW with B.T. Gottfred, author of FOREVER FOR A YEAR + a GIVEAWAY! I am so excited to be a part of the blog tour for Forever for a Year! I had the amazing chance to interview the author, B.T. Gottfred about his debut novel, and get some insight on the book! I’ve already reviewed the book on the blog here, so be sure to check that out after you’ve read this post to hear my thoughts! First, congratulations on the release of your debut novel and thanks so much for being on the blog today! For those that have yet to read Forever for a Year, can you describe what the book is about and why they should pick it up? Forever for a Year is a book about first experiences and being young. What inspired you to write about such an important and impressionable time in a person’s life? Were any of the events in the book based off of real ones from your life? And are any of the characters inspired by those that you knew and/or loved at that age? Yes, I definitely pulled from the emotional adventures I had when I was first falling in love 100 years ago but I also had to turn the book over to Carolina and Trevor so that they could experience whatever they needed to experience authentically without me getting in the way. Forever for a Year is told from both Carolina and Trevor’s point of views. Whose perspective did you enjoy writing from the most, and who did you find more difficult to write? I have just as balanced of a feminine side as I do a masculine side so neither one was easier than the other. But there were days or parts of the book that were harder. For instance, Carolina’s scenes with her father were sometimes very hard for me because he is such a complex guy and she has such a complex relationship with him. Same goes for Trevor and his mother. I also hated writing scenes where the characters were making TERRIBLE choices. I love them but sometimes you just have to let your characters do bad things so you can see how they grow (or don’t grow) from those choices. I found the ending of Forever for a Year to be extremely bittersweet. What were you hoping readers would feel during and after they read the book? Thanks so much for being here on the blog today! Any last words to share with readers about Forever for a Year, and any advice to give readers who may being going through similar situations as Carolina and Trevor? First off, thank you to everyone for (1) being a human being. It’s a tough job so I appreciate you sticking with it;) (2) being a human being with a passion for books. good luck to everyone in everything — b.t.g. 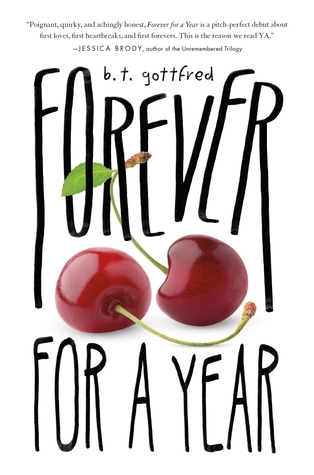 The lovely publisher is offering up a copy of FOREVER FOR A YEAR for you to win!